The Meco Brand is one that is not well known in the US, but has been successfully selling grills in other countries for a number of years. The Meco 9325 Deluxe Electric Cart Grill is just one example of their success in marketing electric grills in the US. This grill looks much like a charcoal or gas grill at first glance but with one important distinction. As with all electric grills it is much smaller, simply because it is nearly impossible to maintain enough heat with electric burners to go any bigger in size. As with any of the Meco products the Deluxe Electric Cart Grill is made of good quality materials including heavy duty steel. This electric grill is unique in that it has 3 separate element positions one of which allows for the placement of an optional rotisserie unit. This electric grill also boasts a 1500 watt heating element to ensure that you have all of the cooking power you need and want. 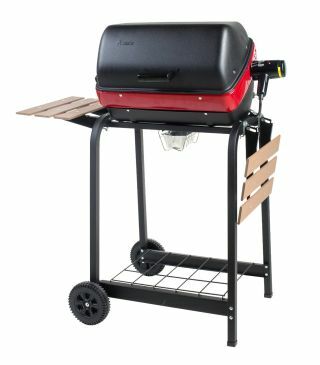 The Electric Cart Grill also comes with 2 foldable wood side tables for setting your grilling supplies on and a wire shelf at the base of the legs for extra storage. The bowl and hood come preassembled so assembly is minimal, easy, and fast. Once you have put the Deluxe Electric Cart Grill together and are ready to give it its first try you will be pleased with how quickly the grill heats up and is ready to start cooking. There is 200 square inches of cooking surface which is more than enough to cook food for the entire family. Keep in mind that food cooked on an electric grill will not have exactly the same taste as that of the traditional charcoal grill which smokes foods as it cooks it, giving it that wonderful grilled flavor. You can put wood chips in the bottom of the grill to help compensate for this, but you are not likely to find that your food will taste exactly the same as traditional grills. Because holding heat is problematic for electric grills the Meco 9325 Deluxe Electric Cart Grill uses a cast iron grilling grate. This grate helps to retain heat to ensure that your grill reaches the proper cooking temperatures. There is a thermostatic controller that has 3 settings and the heating element can be moved closer to the food. You cannot sear with this grill, but you will be able to cook just about any type of meat you want from low and slow to hot enough for regular grilling. The Meco 9325 Deluxe Electric Cart Grill offers a lot of unique features to make grilling fun for every condo and apartment dweller that cannot use a charcoal or propane grill. The grill is easy to assemble and even easier to use. The grill is easy to clean and there is no ashes to worry about. There is a grease trap to keep the mess contained, and a handy window lets you watch food cook without lifting the lid. The Meco is light weight and the two wood sides fold down to make the grill as compact as possible. If you are looking to grill but cannot have propane or charcoal this little grill will do the job. The Meco Deluxe Cart rated well for construction and ease of use with reviewers on Amazon. Most of them love the way this electric grill cooks stating that food comes off tasting like it was cooked on a grill. Many electric grills fail at this point and food tastes more like it was cooked in a frying pan, so this was a welcome surprise for those who purchased it. However one of the things that many reviewers did not like is how hard this grill is to clean or the fact that it did not get as hot as they would like. Some of the reviewers used aluminum foil to keep the grill from being impossible to clean. There are also a few instances with elements burning out too fast. The company is good about replacing the ones that do but it could prove to be an inconvenience. It is difficult to recommend this electric grill due problems reviewers had with flare ups and elements shorting. There are electric grills that hold up much better and provide better value for the price. I own a Meco Aussie 9329W electric grill and cart. Its a great grill, cooks evenly and no flare ups ever that I have seen. The cooking area is not huge but enough to do the job unless you are feeding more than four people at one time. Great for boaters or apartment/condo living where flame grills are not allowed. I highly recommend!